Designed to provide a great combination of padded comfort and support, the 1000 Mile Tactel Fusion mens running socks will help you to run that extra mile every time and maximize your performance. 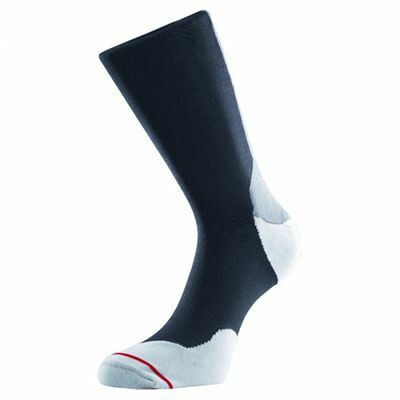 These lightweight and breathable socks with top venting for temperature regulation will keep you cool and fresh while working out and offer an arch brace to hold your foot in place for added support. They guarantee fully cushioned Achilles tendon protection and feature a double layer construction for minimized friction and reduced wear to prevent blisters. The Tactel® inner layer wicks away sweat and ensures your feet stay dry for longer, plus the socks are machine washable at 30°C. [Fit Guidance: Choose the same size sock as your foot size. If you have narrow feet (D or less for men, B or less for ladies) or are on the border between sizes, you should go down a size. The sock should be a snug fit with no wrinkles. for submitting product review about 1000 Mile Tactel Fusion Mens Running Socks.